Creag an Loch is a newly-built one bedroom house, offering comfortable accommodation for 2 people. With tastefully decorated rooms and all the home comforts, Creag an Loch is your home away from home. 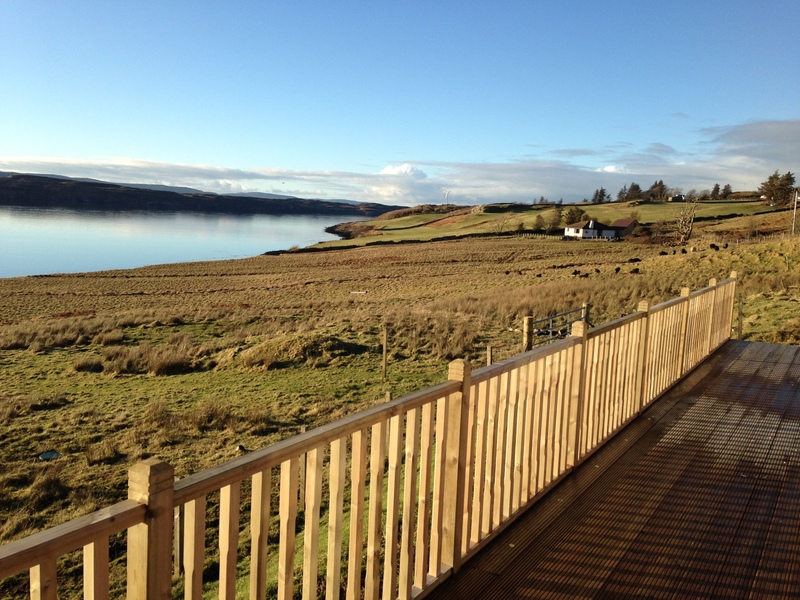 Relax on the decking with a cool drink in the summer, watching the breathtaking sunset over Loch Snizort. Perfect location to relax and unwind. Our family have lived on the croft at 12 Kingsburgh for seven generations. Kingsburgh is where Flora MacDonald lived after helping Bonnie Prince Charlie escape to France following his defeat at the Battle of Culloden . Creag an Loch is situated in an idyllic location in the crofting township of Kingsburgh, offering stunning views of the gorgeous Loch Snizort and the magnificent Cuillin Hills. 12 Kingsburgh is 8 miles from Portree, and 7 miles from Uig providing a perfect peaceful, yet central, location for exploring our beautiful Island.